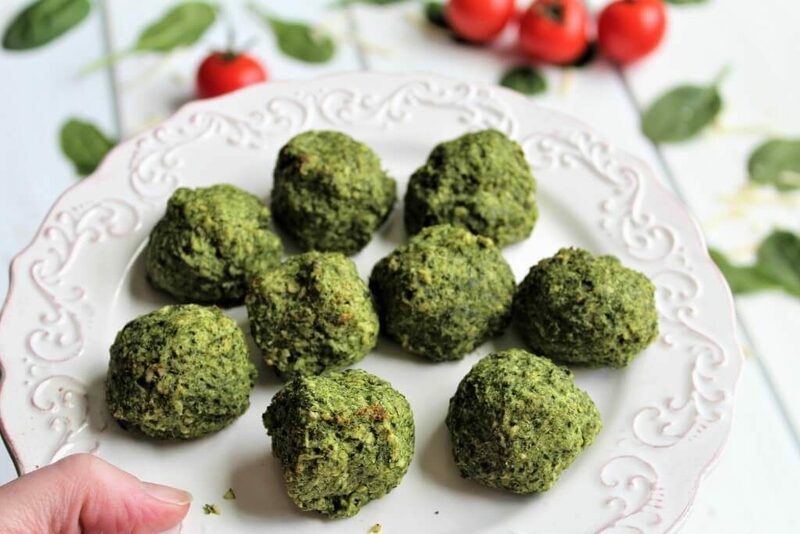 These vegan spinach balls are perfect for your next party or holiday. They’re dairy-free and can be made gluten-free as well, so everyone can enjoy them. They work great as a hot appetizer, a yummy side, or a hot snack. My kids even love them packed in their lunches! 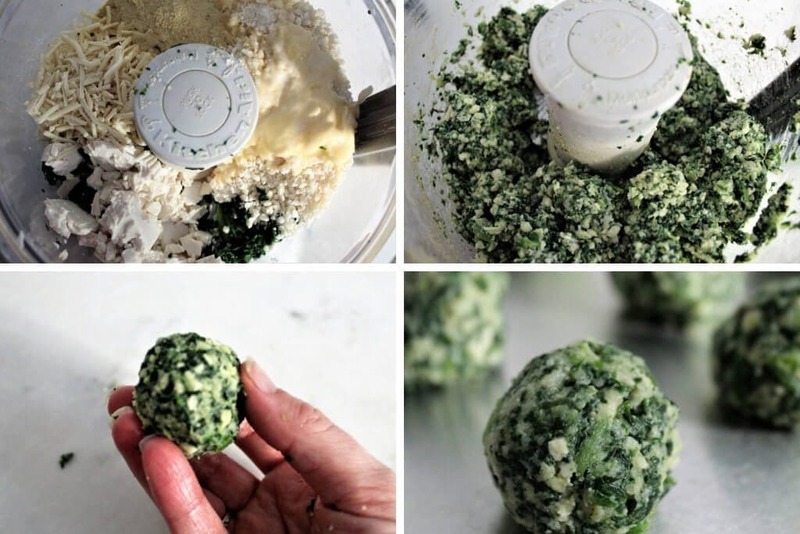 Can I make spinach ball ahead of time and freeze them? Yes! They are easy to make ahead and freeze. When you are ready to eat, just pull out the number you need and heat them up. Bake them on a cookie sheet directly from the freezer and you have a vitamin-packed spinach bite. Make them whenever you have spare time and keep them in the freezer ready to pop in the oven. You may even want to double the batch to have lots on hand for quick snacks. Perfect for kids and they make great toddler food too! I love that you can just pop in however many you want and heat them up like you would tater tots or French fries. How do you make vegan spinach balls? Start by thawing a 16 oz. bag of frozen spinach completely. Press the spinach to the side of a bowl with a spatula to squeeze out all excess water and drain. Then add remaining ingredients and mix well. (I use my vegan melty mozzarella recipe in these and my homemade vegan butter. You can use those or you favorite vegan brands). 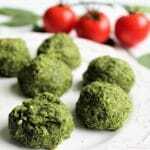 *These vegan spinach balls are very simple to make if you have a food processor. I just throw in all the ingredients and give it a few pulses until all the ingredients are mixed together. (Make sure to press and drain excess water off the spinach). 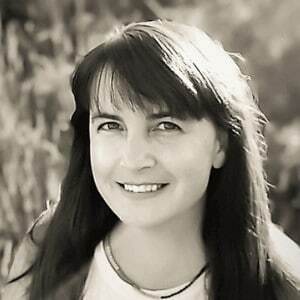 Then take about a walnut sized ball of the mixture and roll it into bite-sized balls with your hands. 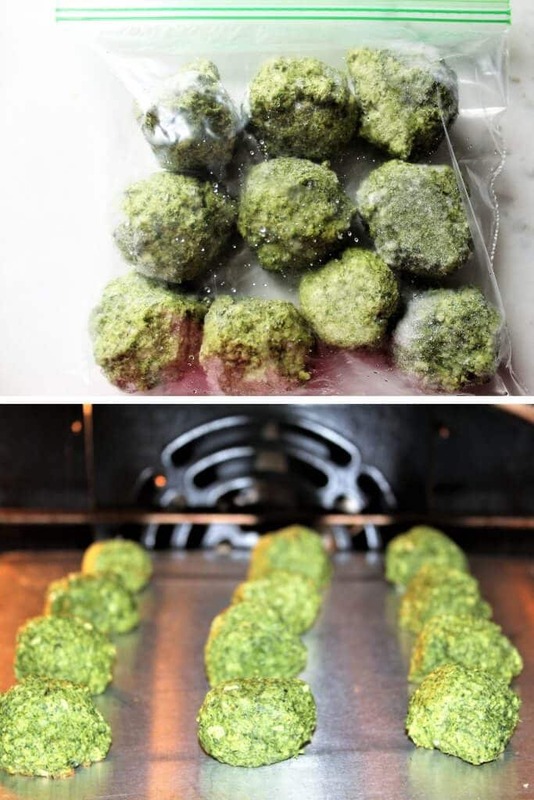 Place the spinach balls on a cookie sheet and place it in the freezer for about an hour until they are frozen. Remove frozen balls and place into an airtight bags or container and put back into the freezer until ready to use. These will keep well in the freezer for about 3 months. When you are ready to bake the spinach balls, place them back onto a cookie tray about an inch apart and bake them for 20 minutes. Serve hot. 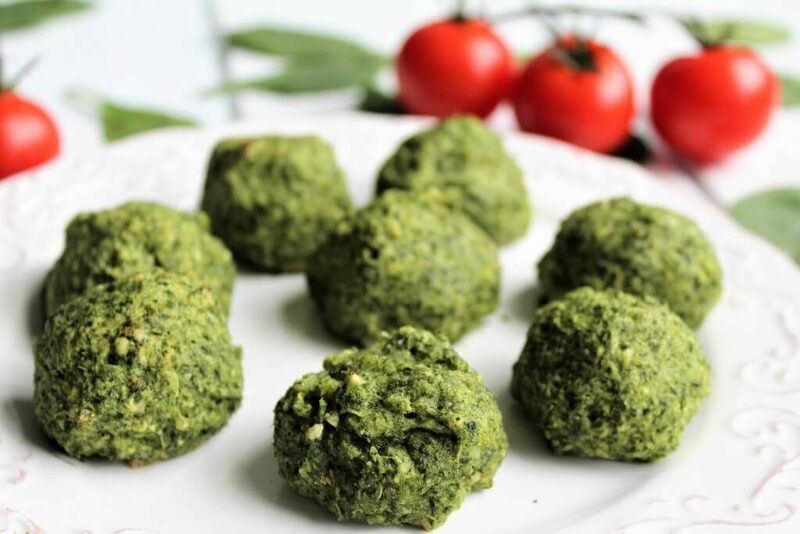 How do I make these vegan spinach balls gluten free? You can use stuffing or breadcrumbs in this recipe interchangeably. To make them gluten-free, I usually use these gluten-free Panko bread crumbs. Strangely, I find them at my local Asian market. If I don’t have these I also use Ian’s gluten-free Panko breadcrumbs. Gluten-free tip: When I make them gluten-free make sure to let them sit for about 10 minutes before rolling into balls. This gives the breadcrumbs more time to soak up the moisture. How do I find vegan stuffing or breadcrumbs? If you don’t need them to be gluten-free, you have a lot more choices of breadcrumbs or stuffing mixes that will work. Just be sure to check the packaging for dairy or egg products. Panko breadcrumbs work well, but stuffing is seasoned, so it gives it more flavor. When I used to make them with gluten, I always used Pepperidge Farms cornbread stuffing because it’s easy to find, I know that it’s vegan, and the seasoning gives the vegan spinach balls a nice flavor. You have to try this delicious recipe for vegan spinach salad with “chicken” and strawberry dressing! 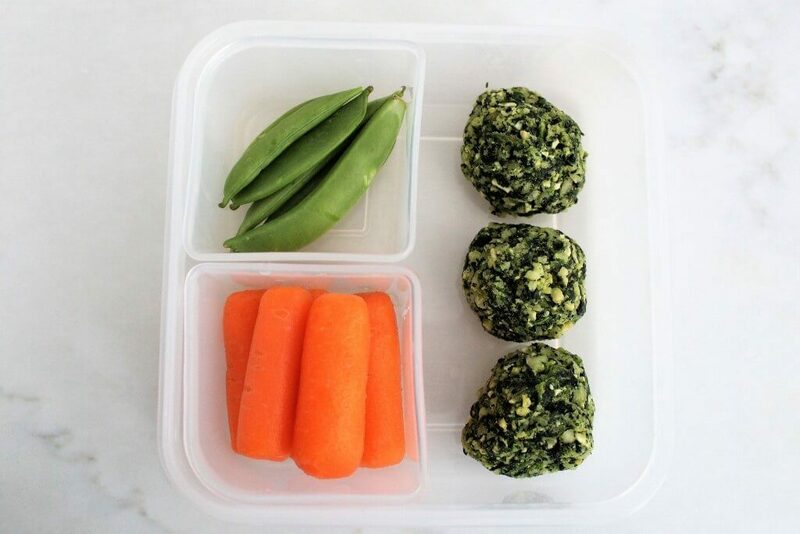 Don’t forget to pin the vegan spinach balls recipe for later! 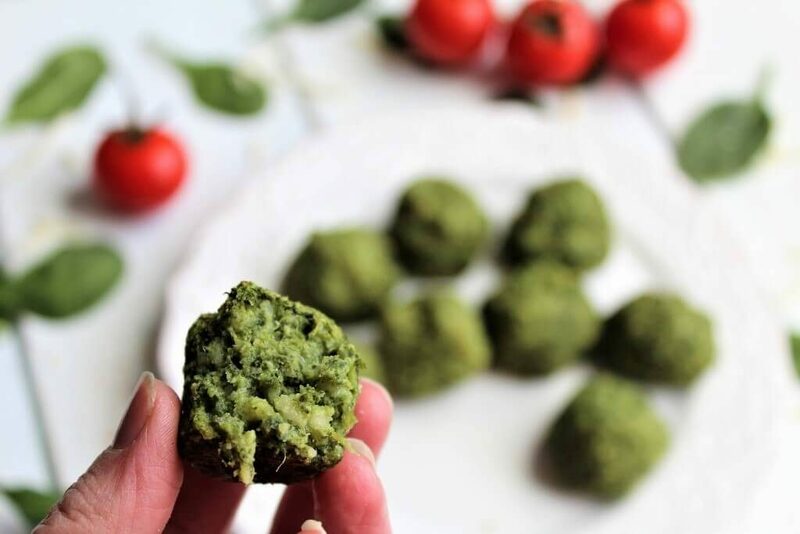 Vegan and gluten free spinach balls that make a great hot appetizer or a healthy snack. Make ahead and keep in the freezer. Pop in the oven when ready to eat. Thaw frozen spinach and press and drain all excess liquid. Add all ingredients in a food processor and then pulse a few times until all ingredients are mixed thoroughly. Take spoonfuls of the mixture and roll it into 1 inch balls with your hands. Place balls on a cookie sheet about an inch apart and set in the freezer for 1 hour. Remove the balls from the cookie sheet and place in a freezer bag. Squeeze out the excess air and seal shut. (Keep frozen for up to 3 months). Place frozen balls on a cookie sheet about 1 inch apart. Bake from frozen at 375° F for 20 minutes until the balls are firm and the outside is just barely starting to brown. Cooking time will vary slightly on your oven and on the size of the balls. If you are using gluten free panko breadcrumbs, allow the mixture to set for about 10 minutes before rolling into balls. (It takes longer for it to soak up the mixture). If you are not making these gluten free, Pepperidge Farms cornbread stuffing mix works well for this recipe. The salt needed in the recipe will depend on the type of breadcrumbs or stuffing used. Some already have added salt and it will need less salt added. Make sure to drain excess liquid off of the spinach or your balls will be too wet. Don't bake the balls without freezing first. They will be too soft and flatten out. (My secret vegan butter recipe works great in this recipe). what kind of vegan shredded cheese have you found you like to use in these? Hope that you enjoy them! They are one of my favorites! I made these for Easter and the whole family loved them! I like how you can make them ahead and keep them in the freezer!